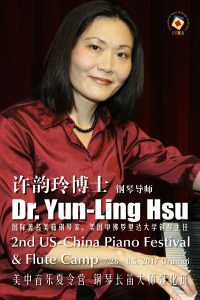 UCF Piano Professor Yun-Ling Hsu was invited as the guest pianist for the Second US-China Piano Festival held in Ürümqi (Xinjiang Province), Northwest China from July 28 to August 5, 2017. The largest city in China’s western interior, Ürümqi has been a multi-ethnic city and was a major hub on the Silk Road. The festival has been specially organized and sponsored by an international music association and two art educational centers in Xinjiang Province. In festival Dr. Hsu performed a recital, presented a lecture, taught lessons and master classes to young pianists, and also judged the Elite Young Musician Competition.